OK... before you start to post angry comments about how bike racing is a chess game on bikes, let me clarify. I'm not saying that these 3 things are the only things you ever need to know about tactics. That should be obvious to those that read this blog regularly. My only point is that a lot of times when we refer to someone as "a smart racer" we are referring more to their ability to implement a few simple rules than their ability to devise a genius level tactical plan. So what do these people possess that others don't? I would argue that it's a strong competitive drive that allows some people to perform at their best (or perhaps even better than they should be able to) on race day. They have a little bit more focus. They are able to take risks that most people aren't, though they almost always seem to get through without incident. Fear not, a competitive drive is not something that some people are simply "born with" and others aren't. In fact, we are all born with it; it's only a matter of how much we've nurtured it. In their book "Top Dog", Po Bronson and Ashley Merryman argue that it's important for parents to foster a spirit of friendly competition within their children. This can be accomplished, amongst other ways, by "roughhousing" with your children. "We can build up children's competitive fire through group play, roughhousing within limits, and teaching them never to quit. And it seems that if we push these buttons correctly, those kids will grow up into strong competitors as adults"
Note the inclusion "within limits". Roughhousing with siblings may have the opposite effect because inevitably one sibling dominates and they are not mature enough to understand and accept those limits. 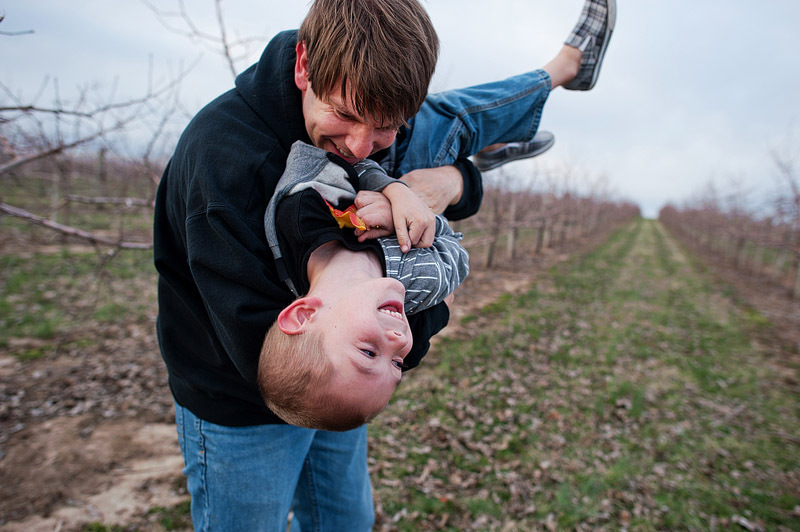 Roughhousing with a parent allows the child to be physical and competitive but always safe. Nurturing a competitive spirit doesn't end with the onset of adulthood, though the responsibility for doing so must pass from parent to self. In a training context, if we want to win competitions we cannot limit our preparation to the physical. Don't wait until next race season is about to begin (or worse yet, has already begun) to start this preparation. Benjamin used to say to his athletes that they should think about other forms of competition they could do when they weren't racing their bikes. Maybe it is cyclocross or running races or an indoor soccer league or a weekly "fast group ride". Maybe it is watching bike race videos and reading books about tactics. Or maybe it was something totally different, like fantasy football or a weekly card game (note: Ben is himself an avid poker player). This fall, I decided to take up blackjack. Well, "take up" may be too strong a term at this point since I haven't bet a single dollar yet. At this point, it's more just learning how to play and win at blackjack. Of course the last part is critical. Blackjack, like any casino game, has a house edge, meaning that if you play long enough the law of large numbers ensures that you will lose money. However, unlike many other games (slot machines in particular), the house advantage in blackjack is relatively small, as little as 0.3%, meaning that you will lose, on average 30 cents for every $100 played... assuming you play perfectly. This is a huge assumption of course and the fact is that because most players are far from perfect at basic strategy, the casinos make much more than 0.3 cents on the dollar. For a player to minimize his losses, he has to first learn perfect basic strategy (see chart below). For a player to win, he has to count cards. Counting cards, in principle, isn't as complicated as you might think. For example, the simplest card counting method, "Hi-Lo", involves starting with a count of 0 and then adding +1 for every low card (2,3,4,5,6) and subtracting -1 every high card (10, J, Q,K,A). If you try this with a 1,2,6, 8 or however many decks, the final count should be 0 if you counted perfectly. The basic idea at a casino is that when the table reaches a favorable count (perhaps +5 or higher? ), you bet more money because that house advantage has turned into a player advantage. Before I go any further, I feel like I must make an obligatory note about counting cards in blackjack. Counting cards is not illegal, but it is "frowned upon" by casinos. Usually, when a casino discovers that a player is winning by counting cards, the casino will ask them to leave and not come back. In other words, they won't arrest you or break your hands like you may have seen in the movies. Some argue that many casinos even encourage card counting, or at least the notion of card counting (card counting books can often be found in casino gift shops). The simple reason for this is that most people make mistakes and actually lose more money than they would by just playing basic strategy. 1. It's not just about what you have in your hand. In advanced blackjack the right move is determined by a) Your hand, b) The dealer's hand and c) The count. For example, if you are dealt an Ace and a 7, you would stand if the dealer is showing a 2, a 7 or an 8, double down if the dealer is showing a 3,4,5 or 6 and hit if the dealer is showing a 9 or above. 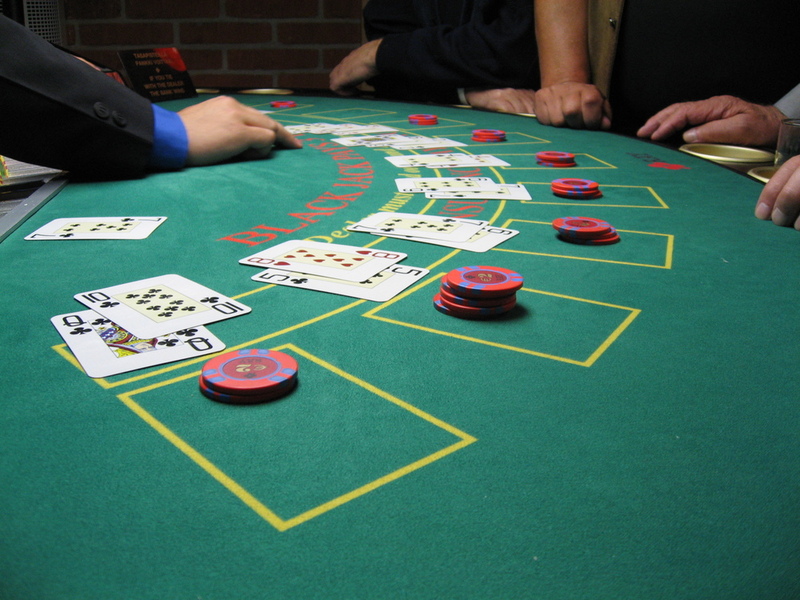 Beginner blackjack players are likely to look only at their own hand. Perhaps they just hit until they have at least 17 and then stand. Better players change their move based on what they have and what the dealer is showing. Great players understand how the odds change throughout the game and they bet big when they know the odds are in their favor. Likewise, beginner bike racers tend only to look at themselves. They feel great, so they attack. They feel like crap, so they sit in and try to survive. Good bike racers attack when they see that everyone else is suffering and they sit in when everyone else is looking fresh. Great bike racers commit 100% to the moves that really have a chance of winning. 2. You will always lose more often than you win. Like I stated before, if you play any casino game long enough, you will lose. For example, a playing basic strategy with a 0.3% house advantage might result in a 45.6% chance of winning any given hand with a 45.9% chance of losing and 8.5% chance of a push (tie). So even if you count cards, you still lose more than you win. The difference is that when you win, you win big. Although the odds of winning a bike race are far smaller even for the best racers, the idea is the same. Even the best bike racers in history lost a lot more races than they won, but one big win can wipe out a hundred losses. You just have to know when you have the advantage and not be afraid to use it. In the 2004 Milan-San-Remo, Erik Zabel was so happy about winning the race that he... well, forgot to make sure that he had won first. 3. Don't let emotion cloud your judgment. A good blackjack player realizes that he will win sometimes and lose sometimes. In fact, losing is part of the process. Of course, this sounds like a no brainer for anyone with a basic understanding of probability, but when you are at the table losing hundreds if not thousands of your hard-earned dollars (or winning them for that matter) it's a little more difficult not to have an emotional reaction. In itself, feeling happy when you win or upset when you lose isn't a bad thing. The problem is when emotion causes you to make bad decisions. One of the classic "gamblers follies" is to try to make up for past losses by betting big rather than honestly evaluating the situation and making the right decision based on the situation. For example, a gambler might lose $100 on one hand and then bet $200 on the next hand in order to "make up for it". Now, in blackjack, if the count has suddenly become more favorable, this bet might make sense but the loss itself doesn't change anything. Likewise, many bike racers make dumb moves after a setback. They get spooked by a crash so they spend the rest of the race trying to stay safe rather than put themselves in a position to win. They feel good when a lot of others are suffering, so they try to ride everyone off their wheel on the climb. They miss the break so they try to singlehandedly chase it down. Feeling disappointed after a loss, happy after a win or scared after a crash is normal and healthy, as long as you keep your head and make smart decisions. In bike racing as well as blackjack, there is never a sure thing but there are smart bets and dumb bets; usually when people make dumb bets it is because they are clouded by emotion. 4. Preparation, practice and discipline are key. It can take months if not years of practice to become an effective card counter in blackjack. But even then it's important to practice. Many card counters carry a deck of cards with them at all times. They practice on computer simulations and they stay up to date with new information, rules and strategies. Being successful at bike racing is not only about continuing our training month after month and year after year but also updating our methods and thinking critically about ourselves. This fall and winter, I suggest that you find ways to grow your competitive spirit as well as your muscles, heart and lungs. When I ask my athletes to take a step back and look honestly at their biggest successes and failures of the season as well as the reasons to which they attribute them, it is striking how rarely the word "fitness" comes up and how often the words "confidence" and "nerve" come up. If you think that this is something you can improve on, there's no time like the present to start practicing. Colin Sandberg is the owner and head coach of Backbone Performance, LLC. He is a Cat. 1 road racer, a USA Cycling Level II coach and a UCI Director Sportif. He is also head coach at Young Medalists High Performance and race director for Team Young Medalists. If you are interested in coaching or if you want to find out more, check out Backbone Performance at www.BackbonePerformance.com or like us on Facebook at http://www.facebook.com/BackbonePerformance. Thanks for reading!